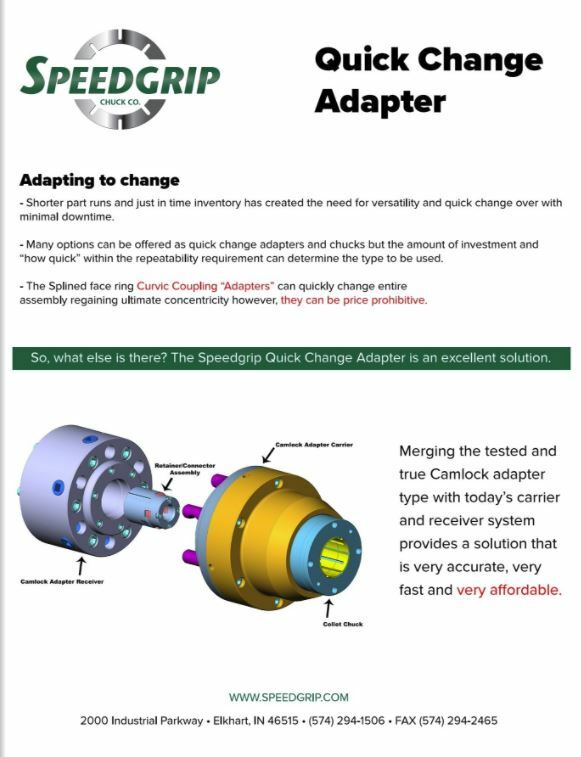 Quick Change Chucks & Adapters - Speedgrip Chuck Co. 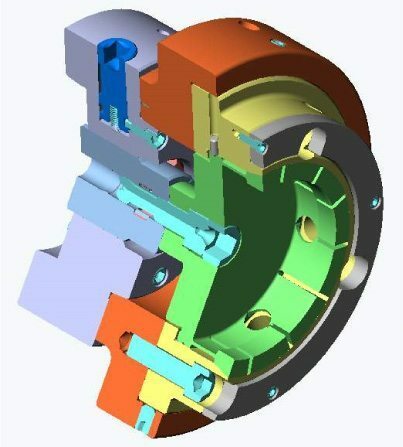 Smaller part runs, just in time delivery, and change over for a variety of part sizes, configurations, and required machining has made the need for quick change more necessary than ever before. Our engineering offer many options for change over for collets, workstops, and more. 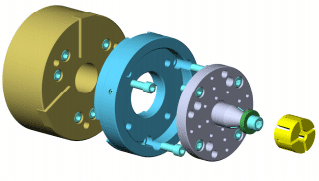 The options to follow allow for change over for a complete chuck quickly and effectively. The system using the splined Curvic coupling though simple can be very cost prohibitive. The Speedgrip Quick Change system is an excellent option for simplicity and cost. 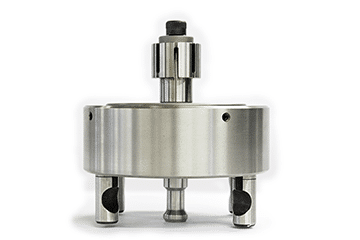 Using the tried and true Cam-lock technology with today’s carrier and receiver, our system provides a solution that is accurate, fast, and affordable. Mount a Cam-lock adapter “receiver” to the spindle and retainer connector to the drawtube. A carrier adapter to the jaw chuck, ID collet chuck, OD collet chuck, or face driver with its retention knob and you are ready to go. When 1st operation is complete on a jaw chuck and next operation would be ideal of a single, double, or Sabertooth collet chucks. However, removal of jaw chuck for a short run is just not feasible. 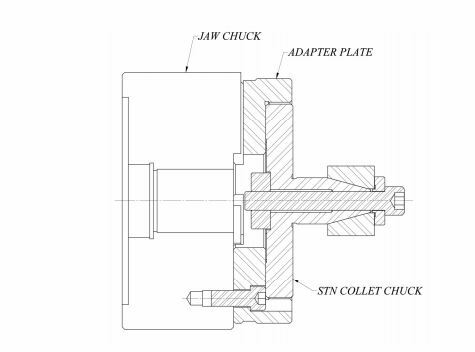 The Speedgrip Jaw Chuck adapter is a quick and simple solution. Removing only the top jaws, mount the adapter to the face of the jaw chuck. 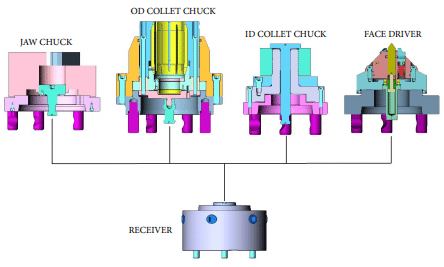 Stir in using indictor band and in minutes you are ready to go and with the concentricity and repeatability of the collet chuck you expect and can even change the collets for additional parts sizes without any additional involvement. The chuck above shown is manually actuated. However, by connecting the drawscrew to the Machines drawbar / tube the chuck is actuated by the same cylinder as the jaw chuck. 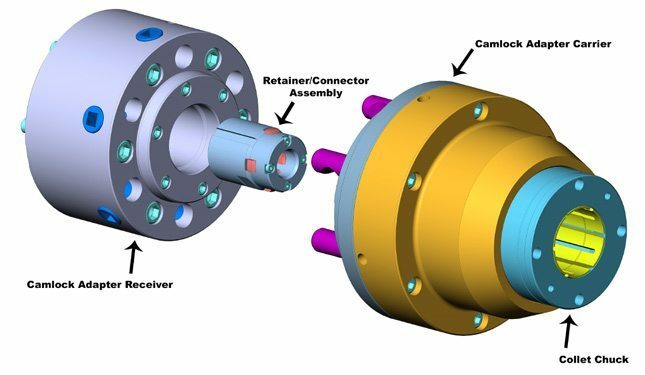 An intermediate connector and modification to the machines drawtube (one time only) is required. Access the folder of Quick Change adapter flyer and brochure for review designs and their attributes.